You might be interested in a new book I just published on lulu.com about the Shroud of Besançon. 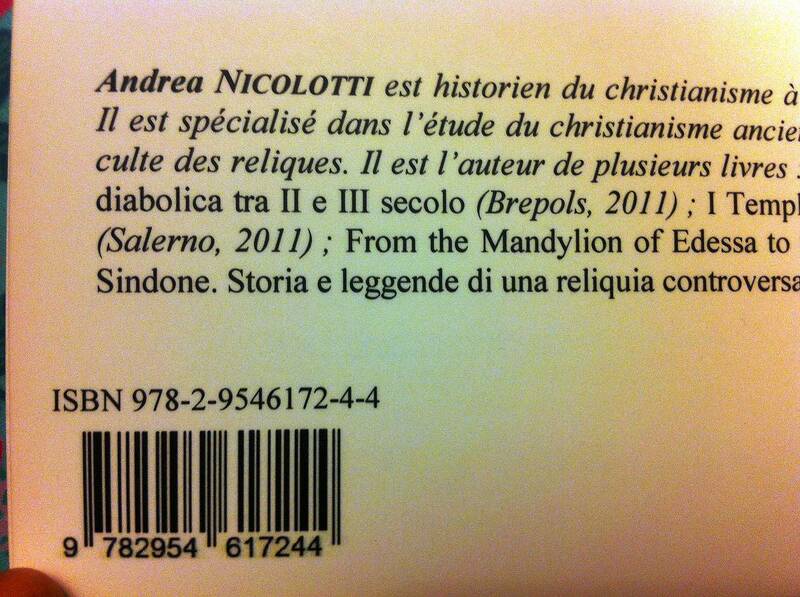 The book is in French, but it may interest many of your readers, at least Andrea Nicolotti…. Thanks, yes. I wish I could read French. But, yes, this blog has many people who read French in addition to Andrea. Do you know the Shroud of Besançon? It was as popular as the Shroud of Turin for almost three centuries. It disappeared in 1794 during the French Revolution. Do you know the 18th century manuscrit (known as Ms 826) containing two dissertations on that Shroud? One dissertation is for its authenticity, whereas the second one is against it. The first dissertation has a proof of the origin of the Shroud of Besançon from Constantinople. So it says. But that proof has been shown to be somewhat dubious. Yet, this dissertation, and its proof, was cited numerous times by scholars and historians on the Shroud of Turin. Discover this proof by reading the manuscrit, and the comments presenting it, in the following book, just published on lulu.com. Mario goes on to tell us that his book will be available on Amazon and from other distributors in France in the near future. Moreover, an e-book is in the works. Gosh, I wish I could read French. Maybe when the e-book comes along I can figure out how to feed it into Google or Bing. And in a note of interest on his Sindonology home page, Mario tells us that Andrea Nicolotti and Cécile Brudieu will also be publishing a book on the 18th century manuscript. In French, I imagine? With a post signed February 24, 2015 (http://www.sindonology.org) today you announce there and in this blog that you published a book written in French, that «presents a complete transcription of both dissertations [of the manuscript 826]. The transcription of the first dissertation, for the authenticity, is new because this dissertation was never published before». I have started to work on it three years ago. My book was ready at the beginning of 2014. I sent the proofs to a professor of medieval history in University of Besançon and he, in September 2014, asked me to publish it in a collection directed by him. My book was printed on December 2015 and put in legal deposit on January 2015 (as it is written on the book himself that I have in my hands). In all this time you never know ANYTHING about the manuscript 826. In a discussion WITH ME on this blog on 1 December 2014 you asked me information about my book that you found JUST ANNOUNCED ON THE WEB FROM 23 NOVEMBER, BECAUSE IT WAS JUST FINISHED. On that day (1 December 2014) you looked for the manuscript 826, you found it on the web (it is online only because I paid the library for scanning every page of it FOR ME two years ago, and after they put it online) and on that same day you wrote “I just found it on the web.. I will read it”. So, until 1 December YOU NEVER SAW that manuscript, when my book was just printed and waiting to be distributed in Besançon. And you knew it, because it was just announced on the web. The order paper is online from November. In Besançon they are waiting for my travel there to make two presentations in University and Diocese organized by them for 4 and 5 march. So, in two months or less you made a transcription from the images online paid by me, and you prepared your book, that contains, I think, a simple transcription of the manuscript, without any deep commentary. I transcribed it with a deep commentary (194 pages totally), and I have identified who wrote it, and his sources. And now you present a book printed by Lulu, a print-on-demand editorial who can prepare a book in few weeks or less, writing on the cover that the manuscript “was never published before”????????? This is very disappointing, dishonest, deceitful, fraudulent. I ask you to change your presentation on http://www.sindonology.org/ and also change the cover and the part of the text inside the book where you said that you prepared the FIRST TRANSCRIPTION of the manuscript. You can do it, Lulu does not print books if they are not bought. This blog is made to share news, or to stole news? This is an open question. “As the manuscript is in French, and the Shroud is French, it seemed to me useless to do an Italian book. So, ****I have transcripted the manuscript****, and I have written an introduction and commentary”. So, Mario was the first person informed that I did the transcription in abbok justi finished and available for order. And now, after three months, he presents a book writing that HIS transcription “is new because this dissertation was never published before” ?????????????? I understand that you are disappointed and upset. But my aim is definitely not to make you upset. I think my approach is fair in the following way. Yes, I learned late December 2014 that the manuscript 826 is available online from the MemoireVive website. We had some exchanges of details about your upcoming publication and I learned that you were about to publish a book about that manuscript. Clearly, the book was not yet published back then. Of course, I had no access to the transcription you have done but I was aware that you transcribed it, yet, had not been published. I knew the book was about to be made available late February or early March. I did not know you paid for having that manuscript scanned. The MemoireVive website have some (light) copyright claim on that scanned. I contacted them about the possibility of using a reproduction of one page of that manuscript in my book, and their answer was that it was free to do so as long as I mentioned the provenance of that image. But, it turned out that I decided not to use that image in my book. How much did it cost to have it scanned? I am even ready to pay you part of it. Yes, your book has 194 pages. So I expect, given your expertise and time taken to work on it, deep comments in your book. I trust your expertise and I am very eager to read your book about that manuscript. In my book I state that your book is about to be published. On my website (www.sindonology.org)) I do the same. I even just added a link to your page on Academia to the order form of your book. I am promoting your book! When I use the term “not published yet” for that manuscript (more precisely the first dissertation of that manuscript), it means that no clear printed version of the manuscript was available to the public. I think this is a fair definition. What I want to make clear to any reader of my book, is that I transcribed the first dissertation of that manuscript myself and not based on any other transcription. This is restated on the description on the back page of my book, and inside of the book. This is the main aim of stating “version inédite” and states that the transcription was never published before. It is true that you transcribed it before me, and you can definitely claim so, but it was not published when I transcribed it in my book. I think this is a fair description. The main aim is that this transcription should become available in an book form for everybody to read. This is my aim. And it will be at a very affordable cost. I hope you understand my point of view. And again, if you paid for the scanned, I am ready to pay for a part of it. I have not stolen any idea or information that you have provided. I used that information, yes, and I cite its provenance in my book when it is relevant. Andrea, please, do not be upset! On December you learned that the manuscript 826 is available online, BECAUSE OF ME. Five minutes before you had no idea about what is the manuscript 826. My book was just printed at that time, printed but not still on sale (like my book about the Shroud of Turin, printed but not in sale: it will be on sale on 10 March). I said to you, and it was written on the website, that the book has (not “will have”) a transcription of the manuscript 826. THE FIRST complete transcription ever done. A sensible person does not transcript a manuscript just transcribed and being publishing, because it is useless and absurd. And does not publish a second transcription before seeing the first just done before him by another. You knew that the work was just done, because I told you. It was written on the editor’s website. You say that your main aim was that this transcription should become available in an book form for everybody to read at a very affordable cost? Why, if a book like this was just done? The price of my book was written on the page you read: 14 euros. Is not affordable? So, without telling me nothing, you transcribed the text very quickly to publish it as soon is possible with a print-on-demand editorial, in order to claim that you made the FIRST transcription. That was false and you knew it. “Not published yet” and “inédite” have a clear meaning. You run to arrive before, but you didn’t. My book was printed on December. It was put in legal deposit on January 2015. It is just stored at the National Library of France. Some copies are just circulating. Your book was published YESTERDAY, so AFTER. So, your transcription is not “inédite”. You started two years AFTER. Your book arrived some months AFTER. And you knew it. You printed on the cover of your book a false statement. So, it is NOT true that no clear printed version of the manuscript was available to the public. It is a lie. If you had doubts, you should have asked me or my editor. But why doubts? I TOLD YOU. An now you claim to be the first when you are the second; and some readers will be deceived, buying your book or perhaps wondering why a stupid Nicolotti publishes a text already published, which is an idiocy. This is my job, not a game or a pastime. Being editor of an unpublished text is not the same as being editor of a text already published. Some people, unaware, will believe that you are the first editor. I am not upset, I am furious, especially because I see that now you take me for a ride. You have a doctorate and you know perfectly how these works are going. I did not know that the faith on the shroud means also this: it is the SECOND time that a shroudie claim to have done something before me, using my informations. Only because I am generous in explaining things to people who ask me, like you that in this case never heard about manuscript 826 before I told you, and I HAD JUST FINISHED THE WORK YOU CLAIM TO HAVE DONE FIRST. Your money for the images is nothing for me. Again, this is my work, and you were unfair. Stop. I do not tell other things, but you knows perfectly whath think about you. This is very ugly, Mario. Firstly, you have taken advantage of the work of another person without mention him. Secondly, you claim the manuscript have never been published and it is on line. The least that can be asked is a rectification and that you apologize. David, thank you. The problem is not what he wrote about the manuscript: if the manuscript is online, it does not mean that it is “published”, it is only “photograhed”. The pictures of it are online because I bought them when I started to work on it. So, it is true that it was unpublished, but only UNTIL I PUBLISHED IT. The problem is that Mario was totally unaware about that manuscript until he read on this blog my posts, and until he read the information about my book AVAILABLE IN NOVEMBER. So he found this manuscript online on 1 December, when my book was on press and knowing that I had just done the work of transcription. I TOLD HIM. So he decided to arrive before me, copied the manuscript (tedious work, but not so difficult) and put on sale claiming to be THE FIRST to publish it. And he was not, because my book PRINTED has the date of january 2015, and his book has the date of 24 February. in order to arrive first, probably because he thought to be the most clever in the world, he was silent with me and did not wait to see my book, that is the NORMAL thing that every honest scholar does in cases like this: BEFORE it is necessary to see the work just done, and AFTER, if necessary, it is possible to publish some integrations, corrections, etc. Probably his work is hurried and incomplete (he did in few weeks). Probably his transcription is useless, because he modernized the text (that means that he did not reproduce the original text with his French language of the XVIII century, but changed it in a modern French language; that, by the way, means that he DID NOT publish a manuscript, but a PARAPHRASE of it). Probably he made a simple transcription with some notes and without historical commentary. So, there is not true “competition” about me and him. But all this he did with all possible speed, only to announce his work as THE FIRST EDITION (that is not). I asked him to change his cover and his introduction on his book, stating unequivocally that: 1) he knew the existence of this manuscript THANKS TO ME ; 2) That my transcription was just done and on print, when he discovered and started to read the manuscript; 3) consequently, his edition is the SECOND edition of the test, DONE after and PRINTED after. And this is not a matter of pro or against authenticity, is a matter of honesty and true. Thanks for the clarifications to David Mo who has no clue about this subject. First, you keep repeating a lie : I sent you a message to academia.edu to further discuss the manuscript which you never responded. Second, you are very upset (furious as you wrote) about my statement of stating that my work was not based on any further transcription. This is what I wrote in my book. I state that the transcription is “inédite” and I further explain that it was not published before so that the transcription of the first dissertation is totally based on a transcription I did directly from the manuscript put online. Of course, all due references are made to that manuscript online. Third, you keep writing that you paid to have the manuscript scanned. But MemoireVive claims total copyright of these scanned images. I contacted them and they never mentioned you as having paid or help paid for the scanning of that manuscript. So, MemoireVive does not record or state that you have any right on that online, so you should not behave as if there is some restriction, beyond the legal ownership of MemoireVive, to use that online document. Fourth, you have not read my book yet and keep making many suppositions about its content. It has commentaries about the manuscript. Probably not as much as you wrote, but hopefully put in the write context. I do not comment on your book because I have not read it yet. Fifth, you never mentioned in the presentation of your book that the second dissertation of that manuscript has been published before. Twice actually. I am clear about that right up front (from the back page of my book) and the description of my book so that the reader is aware of that part of the manuscript is already available somewhere. I think the presentation of your book is misleading on that matter. Sixth, I did modernize the French language of both dissertations for reasons explained in the book. But a scholar can still refer to the online manuscript because every folio is referenced in my transcription. I even intend to make an ebook version where the reader can click a link and see the corresponding scanned image on MemoireVive of the transcription in my book. Besides, this is 18th century French, not medieval, so the original French text is not that far from modern French. Finally, I repeat partly what I have already written to you : you can claim to have first transcribed completely the manuscript. I am not claiming that, that would be a foolish claim. Many people may have transcribed it before and that we are not aware of it. This is not so important anyway. I think you are making a huge fuss about that. Clues? What clues? I know a little the academic world. And I also know that if you have obtained some information from a precedent unpublished work or from another person it is a good practice to mention it and a bad practice to conceal the fact. These are the bases for intellectual integrity. A list of acknowledgements is usually included on the books. Do you know it? 1) I never received messages from you on my Academia. Never. I answer to all people. I have a website and a page at my university with two different emails. You could contact me through this blog, or ask if I received a mail. If you did not contact me, is because you did not want to do it. But any mail does not change the situation: I had finished a book with a transcription you were starting to do. Stop. You knew it. 2) In your book you state that the manuscript is “unpublished” or “inédite” that means only a thing: never printed before. You knew that my book was on press, so simply you tried to precede me, stealing my idea, but you failed. So you are both dishonest and lier. 3) Do not try to change argument with discussions about money or if I am or not misleading in the presentation of my book. Please, stop, it is pitiful. We are speaking about a very precise matter. No more. The readers and specialists will judge the content of my book, not you here. 4) You try to change the meaning of a very simple concept: text edited or not edited. The strange meaning you suggest, it is your invention. You claim to have made “une transcription inédite”, saying that my transcription will arrive after your transcription, so presenting you as the first: in reality I made the work before you and you knew that manuscript only because of me, when you learned that my book was just on press and publicized. It is clear that you made all this to publish before me a manuscript that five minutes before you did not know. In the first pages of your book is not made any reference to the fact that I made you know the text and I had just a book on press with the transcription. It seems that you made the work before all people. It is not a crime, it is a huge unfairness. All people and colleagues understand exactly what I am saying. For me the question is closed, you did what you wanted to do. But, if you have in mind to come near the Turin cathedral on the next exhibition, you must hope that I do not recognize you, because it could be very awkward.